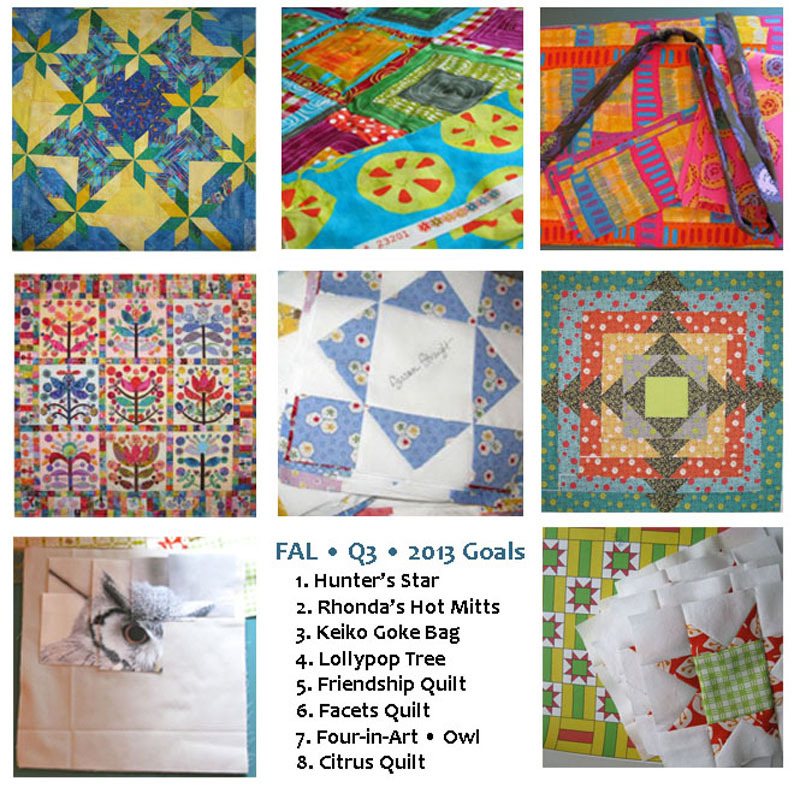 Finish-A-Long, Quarter 3 Goals | OccasionalPiece--Quilt! I’m liking that Facets quilt pattern, especially in the fabrics that you chose for it. I’m amazed at the number of projects you and others get done in 3 months. (I think I’m slow with one hand-quilted quilt in 3 months.) I like the looks of your citrus block and the pattern. It will be a fun quilt. The others look bright and fun, too (except the owl, which looks very serious). I hope your foot is feeling better and that you’re getting around a little more easily than a few weeks ago. Maybe you’ll be on two feet again in a few weeks? It seems that doctors say “6 weeks” before surgery, then after surgery they add another 2 or 3 weeks to the healing time — at least that’s my experience. I hope it’s not so for you. You get done in three months what I plan for a whole year! The Citrus is a pretty new one! A beautiful list it is ; ) your appliqué is a great one to do while recovering. You can do it! You are very ambitious! I also signed up for the 3rd Quarter FAL but only with three projects. Eight is amazing! Pingback: At the Bandstand, Under a Starry Night | OccasionalPiece--Quilt! Pingback: Totes (Like I Need Another One) | OccasionalPiece--Quilt! Pingback: Juxtaposition (and a pattern giveaway) | OccasionalPiece--Quilt! Pingback: Hot Mitts | OccasionalPiece--Quilt!